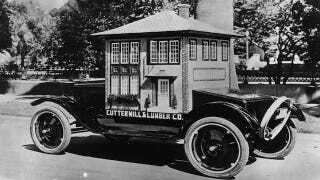 Above: A mobile advertisement for a Sacramento lumber and construction company consisting of a miniature house on the back of a car. Photo by Topical Press Agency/Getty Images. A paper card from the series En L'An 2000 (In The Year 2000, but also known as France In The Year 2000), made by Jean-Marc Côté and other French artists, issued in 1899, 1900, 1901 and 1910. The other postcards and paper cards from cigarette and cigar boxes are available on this Wikimedia Commons page. There are at least 87 of them. This 24 feet long by 24 feet high and 12 feet wide steampunk mansion on wheels was built by built by members of the Academy of Unnatural Sciences in 2006 for Burning Man Festival. Made from 75% recycled materials. More steampunk homes and businesses can be seen here. A party of twelve with Conklin travelled in this from Long Island to the Panama-Pacific Exposition in San Francisco. The bus had a kitchen, beds, cold and hot water, bookshelves and a rooftop garden. After their marriage, the novelist and journalist June and her husband started to travel around the United States until June's death in 1969. In 1941 she published Living High: An Unconventional Autobiography, which has been republished several times. "Aside from a kitchenette, running water and electric lights, the motorhome also boasted a pop-up pulpit and organ. The Downers began their cross-country trek in November 1919, stopped in Washington D.C. in 1920, where these photos were taken, and planned a five-year around-the-country trip with a second gospel car to start in August 1920. No word whether they actually built Gospel Car No. 2 or made that later trip."